The Antique Clocks Guy represents buyers, sellers, major collectors, estates, "pre-estates"... and the small guys, too. We'd be pleased to represent and sell your antique clock, antique barometer or, or perhaps your entire collection. We occasionally accept listings for some high-end, quality antiquities such as bronzes. We provide physical and "digital consignment" options as well as outright purchase of quality collections and estates. We work with lots of families and collectors with what we call "Pre-Estates" so your family is not left with a collection for which they eventually receive ten cents on the dollar. We help keep the vultures from your door and maximize your return on investment! We'll also conduct a search to help you find antique clocks. Whether you're seeking a Seth Thomas Regulator, an E. Howard Regulator, an Ithaca Double-Dial Calendar, a big Waterbury Jeweler's Regulator, a Longcase, Tallcase or “Grandfather's” Clock, an Astronomical Regulator, a lovely French Carriage Clock, a Railroad Clock, or even a 1970s piece from the Gazo Family Clock Factory or Herschede Hall Clock Co., we’ll get to work right away on your behalf. And there is no charge for those services... honest. We've been a member of the NAWCC since 1973 (National Association of Watch and Clock Collectors). We support the integrity standards of the organization. This site is populated with lots of wonderful antique clocks, and that's only a drop in the bucket of all we have available for you. We always have way more antique clocks in our available inventory than we have time to display here. If you don't see what you're seeking, just ask us! Don't miss our Antique Clocks Reference Library. It is full of antique clock history articles about specific manufacturers and many other antique clock-related items. If you've researched and written an appropriate antique clock article or history on one of the clockmakers or other related topic, we may have interest in publishing it here. If you're seeking free appraisals this is the wrong website for you (we will, in some cases, do a simple evaluation for a PayPal prepaid fee). If you are seeking an honest antique clock dealer who's been around the dial more than a couple of rotations and who has developed an exemplary reputation for integrity... give us a try... take a look! Bottom line: we're committed to the highest levels of integrity and client service. So, let us go to work for you! We always need quality Vienna regulators for consignment. Call us if you have one or more available! We need more (antique) swinging arm clocks of quality. Do you have one to sell? 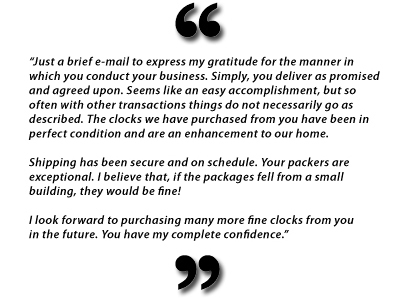 Gazo clocks fly in and out much faster than we can post them to our website. If you have one to sell, please contact us by phone or e-mail. If you are looking for a certain model, please contact us by phone or e-mail so we can get you on the list and find just what you are seeking. Happens every day, but only if we know who is seeking what! We always need more Gazo clocks! Do you have one to consign? Watch here for an occasional clock. and more weight-driven Vienna Regulators. Have An Item To Consign? • Seeking A Specific Item? Let us know what you're seeking or selling!